The exhibit features works from the museum’s collection by renowned artists such as Alexander Harmer, Ludmilla Welch, A.M. Podchernikoff, Charles Rollo Peters, and Henry Chapman Ford. The artwork will be displayed alongside historic photographs by J. Walter Collinge, N.H. Reed, and others, to illuminate adobe structures from the area in a unique and century-old artist’s perspective. Unlike the standardized Spanish Colonial and Mediterranean look of modern Santa Barbara, our downtown architecture at the turn of the 20th century was an eclectic mix of Victorian, East Coast American, rural Western, and traditional Mexican adobe structures. During that time, the faithful adobe-style of construction fell out of popular favor, and as the century progressed, the majority of our adobes became neglected and were demolished or destroyed by the elements. 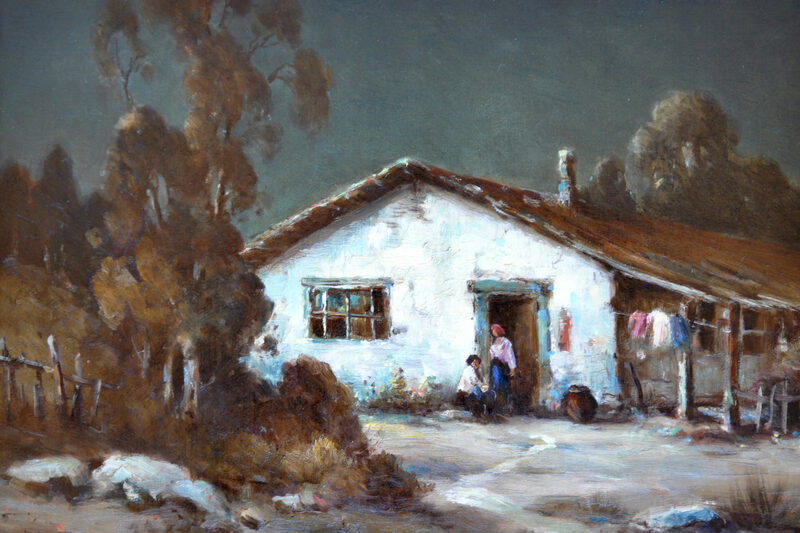 This exhibit will examine the rustic beauty and time-worn romance of our historic adobes – some of which are preserved today, along with others that have vanished forever. Evelyn E. Sullivan, and John C. Woodward.